Around the time of the World Cup 2015, I did an analysis based on a Facebook discussion I had. The analysis comprised understanding how often top batsmen hit boundaries in ODI cricket and how often do they rotate the strike. The main reason behind this was to determine how Pakistani batsmen fared compared to their international counterparts. The results back then left a lot to be desired and it showed that Pakistani batsmen were well behind others in terms of boundary hitting, as well as, running between the wickets. Since that World Cup, Pakistan has changed ODI captains twice. Both captains, Azhar Ali and Sarfraz Ahmed, have talked about changing the way they play ODI cricket. Both captains talked big about adapting to modern day demands, being more aggressive, and improving Pakistan's overall ODI game. That is all that has been there in the two years and a bit since that World Cup - Talk. There has been very little action. I revisited that analysis for the top 50 ODI run scorers since the World Cup 2015. Just to recap, the two measures used to measure the effectiveness of batsmen are Boundary Rate and Rotation Rate. Boundary Rate tells you how many deliveries a batsman faces on average before hitting four or a six. Rotation Rate tells you how often a batsman scores of deliveries that he does not hit for a boundary; i.e. how often a batsman rotates the strike. The average number of deliveries for these batsmen to hit a boundary is 10.7. Only one of the Pakistani batsmen, Shoaib Malik, fares better than this. While Hafeez hits a boundary as per global average, Pakistan's other leading batsmen take a few more deliveries before hitting one. It is interesting to note that majority of the batsmen that hit a boundary every 7-8 deliveries are openers demonstrating the art of utilizing the fielding limitations in the first 10 overs and taking aggressive starts. No surprise that none of the Pakistanis feature there. Rotation Rate tell a slightly different story. The global average is 52.3; implying that batsmen take at least a run on 52.3 deliveries out of 100, off the deliveries that they do not hit for a boundary. In other words, batsmen rotate the strike on average every second delivery they face. Three Pakistani batsmen rotate the strike at a rate better than this - Sarfraz Ahmed, Shoaib Malik, and Babar Azam. Pakistan's ODI captain in fact has the world's second best rotation rate, strengthening the case for Sarfraz to bat higher up the order. Shoaib Malik should probably also be batting a position higher. 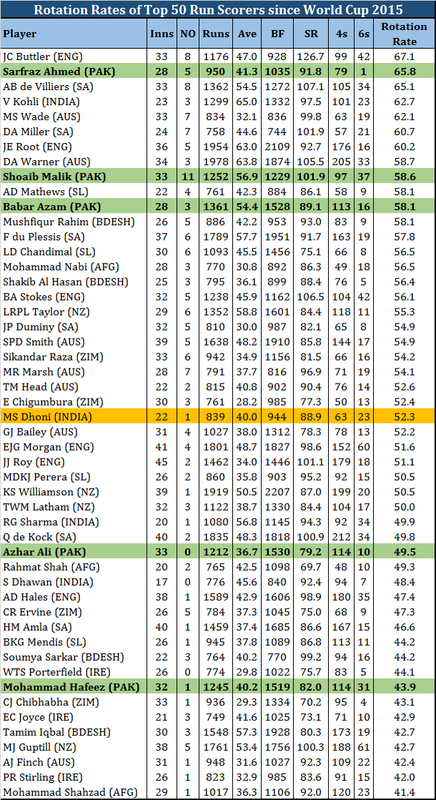 Azhar Ali and Mohammad Hafeez are below par when it comes to rotating the strike. 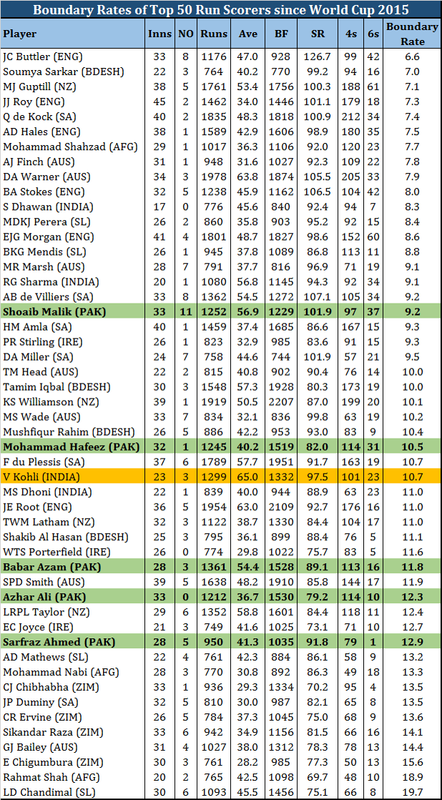 Hafeez, in fact, is outright pathetic as he languishes near the bottom of the table. He has a healthy average and decent strike rate but his inability to rotate strike puts needless pressure on his partners and on the team. So while the new ODI captains have made the big talk, they have not been able to back it up with action. Pakistan has the ability to play modern day ODI cricket; however they will not be able to till the likes of Mohammad Hafeez and Azhar Ali keep featuring in the top 4 of their ODI batting line up. 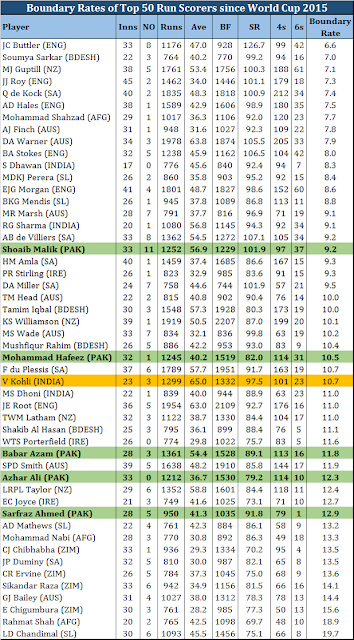 Numbers 5 and 6 are too low for Malik and Sarfraz and they need to be at least one position higher. Sarfraz should maybe open in place of Azhar and ideally Haris Sohail should come in for Hafeez. Pakistan needs to back up its talk with some action in the middle and it can only be done with a change in personnel, because the current one doesn't seem to have the intent to play more aggressively.